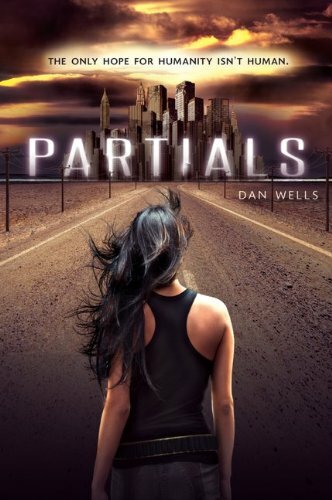 I loved Partials by Dan Wells! This book immediately appealed to me because of the tagline: The only hope for humanity isn't human. At first that made me wonder if perhaps this was an alien invasion story. It turned out to be even cooler -- Partials are robots created to look exactly like humans. But while they look exactly like humans, they are actually fighting machines, and were built to help out with fighting wars. Something went wrong though, and the Partials rebelled against the humans. During this war they released a virus called RM that killed 99.99% of the human population. When Partials begins, we're introduced to the main character, Kira. Kira is a doctor who just completed her internship, and she is determined to figure out the cure to RM. Because while a small percentage of humans were immune to the disease, no baby has lived for 14 years. So the cure needs to be discovered, or the human race will eventually die out. Kira is doing research and she realizes that the key to curing RM might depend on studying those who created it -- the Partials. This is where the adventure begins. There is always something going on, leading to a new discovery. Also, while it's a YA book, I found that it seemed to be geared towards older readers, even sounding more like an adult book at times. Without giving anything away, I just have to say that a MAJOR fact was revealed near the end of the book that left me staring at the page thinking, "OMG I can't believe that's true!" It changed what the entire book was about. Read the book, and you'll know exactly what I'm talking about. Partials is one of those books that after you read it, you think about what an amazing read it was. It's on the longer side, and there were a few times when the pace slowed down a bit. However, Partials is fantastic and I highly recommend picking it up! I can't wait to read the rest of the series. Thanks for the review! I am so excited to read this one! It's been on my list for awhile, and I'm happy to hear it was great. And now with the little spoiler about the ending it makes me even more excited! Yay!! Hmmm.... I suspect a deus ex plot twist, like "they're not really machines, they're displaced humans!" or something like that. Sounds worth a read.